Volunteering is a mutually rewarding experience for the resident and the volunteer. Our volunteers make a real difference in the lives of our residents, providing companionship, guidance and a connection to the outside community. Many of them develop long-term meaningful bonds with our residents. 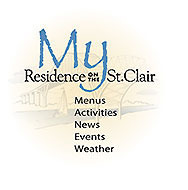 Volunteering at Residence on the St. Clair can mean many things. Teaching a class. Coordinating planned activities. Making a presentation on a topic of interest. Or simply spending quality time with residents reading, playing games or chatting. If you are interested in volunteering, we would love to hear from you. For more information, please contact us today.